* Safe on all colors although we do recommend testing a small spot in a low visible area to test colorfastness. Aristo Water Repellent is a revolutionary product, it is pure water base, without any silicone resin or fluororesin which they will form a hard & uncomfortable layer to get water repel function. Aristo Water base repellent penetrating into the fabrics without changing the material’s softness but get longer & stable water repel function, it is 100% safe and 100% environmental. 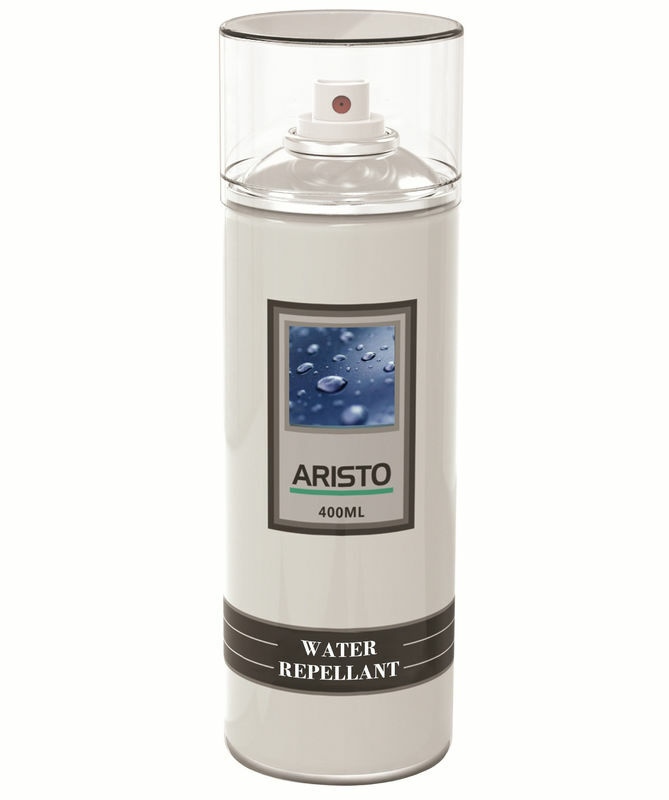 Aristo water repellent can be packed either via tinplate aerosol or plastic pump aerosol for DIY using or we can provide gallon packing for industrial using. It is suitable for outerwear, footwear, tents, sleeping bags and suede, it is specially formulated to apply maximum repellency in a single application. It restores factory waterproofing but still allows materials to breath. It repels water and stains. For aerosol form, shake well before using. For best results, clean surface to be sprayed and allow to dry. Hold can upright 6-8” from the surface and spray evenly over entire area. Allow article to dry thoroughly for 60mins at room temperature (needs faster drying time can adopt our Water+alcohol hyrid base, also recommend use hair dryer to accelerate the drying time). Use in well ventilated area, away from heat and flame because of the flammable propellant adopts at the moment. Do not use while smoking. For gallon pack & industrial application, soak the treated material into water repellant liquid for 30~60mins, then let it dry per factory’s next procedure, not recommend dry over direct heat to protect the fabric. For special or unsure treatment, welcome to contact with Aristo technical service & advise.